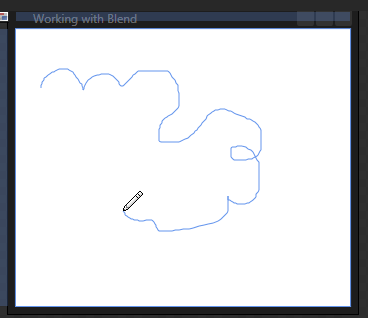 The Pen tool lets you create a new Path element by drawing the path as a series of line segments or connected curves. You can also create a Path using the Pencil tool, which allows freehand drawing. To use the Pencil tool, first left-click to select the Pencil on the tools panel. If the Pen is currently visible, you’ll need to left-click and hold the left mouse button down until you see the popup menu showing the Pencil. Once you select the Pencil, the cursor will change to look like a pencil and you can draw a freehand path by left-clicking and holding the left mouse button down. Notice that this tool creates a Path element in XAML, just like the Pen tool.